Photo by Dylan Nelson: Seattle Police and Fire respond to a vehicle on its side in the 2300 block of McGilvra Boulevard East on Sunday, May 27. 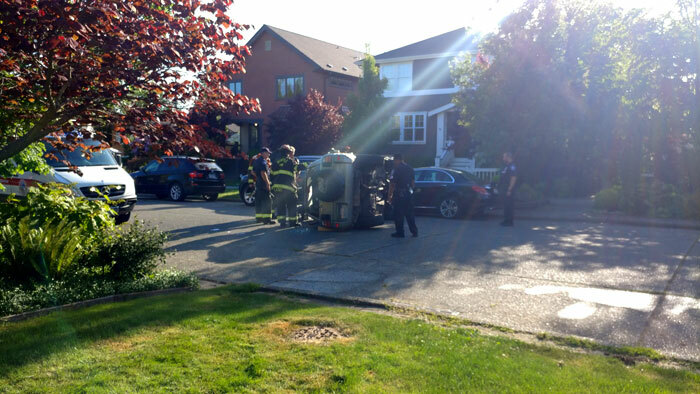 Seattle Police report a distracted driver collided with two vehicles in the 2300 block of McGilvra Boulevard East on Sunday, which caused her Toyota RAV 4 to flip over on its side. Seattle firefighters responded to the scene around 7:45 a.m. Sunday, May 27, and the vehicle’s roof was cut off in order to remove the woman, according to Kristin Tinsley with the Seattle Fire Department. She was then transported to Harborview Medical Center in stable condition by AMR. Seattle Police Detective Patrick Michaud confirmed the collision was caused by distracted driving, and the woman’s Toyota RAV 4 collided with a Mercedes C-Class and Jeep Grand Cherokee before flipping over on its side. It’s likely the driver will be cited, he said.